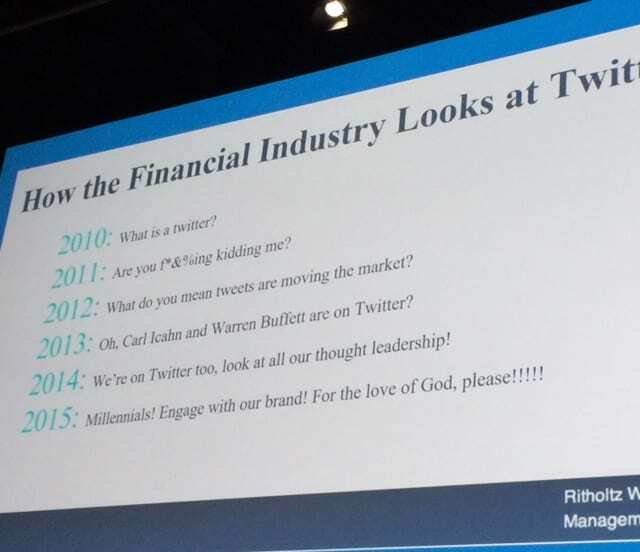 Josh Brown gave an inspirational, gritty speech at #InsideETFs in Hollywood, Florida, as you'd expect if you follow Josh Brown aka The Reformed Broker. By force of will and chutzpah Josh created a big name for himself, his firm, and for the power of social media in the world of finance. Josh is often on TV as a market prognosticator. Is he more brilliant, insightful? Nah. It's his personality, which is the lesson of social media. The joining of Josh Brown and Barry Ritholtz created a social media driven investment business. Ritholtz writes prodigiously for many high powered media outlets. Most finance companies by their nature produce steady streams of valuable content – market research, investment analysis, economic forecasts, etc. This is valuable intelligence that advisors, investors and asset managers crave. How do you get it to them? In the old days (5 years ago) you might send a letter or an email. These days finance companies have myriad opportunities through the web to distribute content that precisely targets their audience. The impact is immediate and long-lasting. Content that lives on the web increases in value over time as it is cross-referenced, searched, and accessed by a growing audience. Most of the time, these distribution channels are free. You need to know how to identify them, access them, and track the benefits. In this equation (content creation + distribution = PR for lasting impact) the first part, content creation is the most difficult. Can you add value to the conversation about the markets, investing, the economy? If so, it’s valuable to content that could be of interest to the media and your target audience. Then it becomes a matter of packaging and distributing that valuable content.